The team at Family Business United are working hard to build on the momentum that has been generated by previous events and are delighted to announce that the 2016 Great British Family Business will be taking place at The British Library Conference Centre, within walking distance of Kings Cross and Euston stations. GBFB2016 will brings together a wealth of family business knowledge and expertise in what is sure to be a family business masterclass. Sessions are planned to cover topics such as Produced in Britain by Family Firms, Governance and the Family Business, Protecting the Name Above the Door, Communicating Effectively Between The Generations and personal insights from numerous family business owners who not only talk the talk but have demonstrated throught their actions how they have 'walked the walk' too. 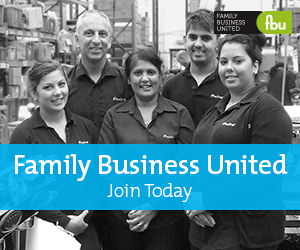 As Paul Andrews, Founder and Managing Director of Family Business United, the organisers of this event explains, "We are delighted to be running GBFB2016 in the heart of London and to have the support of some great family businesses. Nothing resonates with family business owners better than hearing first hand accounts of the challenges that others have had to address, the 'light-bulb moment' when they realise that they are not alone in facing some of the challenges that running a family business creates, and it never ceases to amaze me how open and honest the speakers are when sharing these insights." "We look forward to welcoming the family business community to London in March for what is billed as The Great British Family Business and is sure to be a masterclass in how to make the most of family values in the branding, development, governance and sustainability of the family firm." John was educated at Aberdeen Grammar School and Dundee University. After graduating from Dundee, John went to Chester College of Law where he studied English Law and subsequently qualified as a solicitor in 1990. He went on to become a partner in Bendles Solictors, Carlisle. In 2010 John was elected MP for Carlisle. In 2015 he was re-elected with an increased majority of 2774.John organises and hosts an annual Carlisle Skills Fair. The event is a huge success attracting over 2500 jobseekers and young people and 80 businesses, organisations and training providers from the Carlisle constituency. He has a keen interest in business, education and local government reform and was a member of the Communities and Local Government Select Committee during the last Parliament. He is currently a member of the Scottish Affairs Select Committee and chairs the All Party Parliamentary Group for Family Business. Sarah started running the family business in 2005, after several years of working in the City for NM Rothschild and as a Headhunter. First and foremost, Sarah sees herself as the champion of the business' values, ensuring that that they are the compass for everything the business undertakes. She loves food and constantly strives to strengthen the business' food approach through its home-made food and its relationship with its many artisan and local producers. She works closely with her sister Jane, who looks after the family's farm interests and together they ensure that the connection between the farm and business remain strong. Sarah is our opening keynote speaker and will share her story with a particular emphasis on how to build the heritage and family values into a recognisable brand for the future. Rob is a frequent contributor to the marketing press and delivers talks to leadership teams on the intersection of business, strategy and creativity. Rob’s expertise is connecting the worlds of business and creativity. He helps clients develop strategies and plans for using brand, marketing, innovation, culture and experience to achieve their goals. Aided by his early interest in design, he then works with creatives from all spheres to turn thinking into reality. Rob will join Sarah Dunning in explaining the journey that the family and Westmorland have been on together. After studying Combined Social Sciences at Durham University Sarah began her food marketing career at Unilever working in Brand Management. She transferred her skills later to the charitable sector in corporate fundraising at Comic Relief and then The Experience Music Project, Seattle before joining the family business in 2007. Draught ales from Palmers Brewey win awards because beer drinkers love them. They love the distinctive taste and delicious character. And the refreshing, thirst-quenching qualities of Palmers’ traditional ales. They love the fact Palmers are among the UK’s very best small independent brewers – and that they’ve been brewing fine ales non-stop since 1794. The original Old Brewery at Bridport in West Dorset is where they still work to traditional methods with the finest ingredients. Methods and ingredients that have built their reputation over 200 years. They also operate some of the best-known and best-loved pubs in the South West. They’re the place to taste delicious food, relax with family and friends in great pub accommodation – and enjoy Palmers real ales! Cleeves Palmer will share his thoughts on family business in the UK today as part of our 'Produced in the UK by family firms' panel. Partridges is one of the few family run food shops in Central London and is still supplied by some of the original suppliers. It was opened by Sir Richard Shepherd in May 1972 and in 2004 it relocated to Duke of York Square on the Kings Road. In January 1994 Partridges was granted the Royal Warrant as Grocers to Her Majesty the Queen and in 2008 John Shepherd took great pleasure in becoming the President of the Royal Warrant Holders Association. John is actively involved in the family firm and will share his perspective on the family firm and the challenges faced. Jane Robertson is a member of the 4th generation of the Shepherd family and daughter of Donald Shepherd the inventor of the Portakabin. She has worked for both Portakabin and Portasilo as well as outside the family business in the past. She was a member of the original Shepherd Family Council, which was set up in 2004 and is now the first elected chairman of the Shepherd Family Assembly which replaced the Family Council in 2012. Jane has also recently taken over as Chairman of the Institute of Family Business Family Council Forum. Jane is our closing keynote speaker and will share the journey that the family has been on in recent times and some of the big decisions that they made as they plan for the future. David Dickson was the Senior Partner of Garbutt & Elliott LLP, Chartered Accountants until June 2015 having joined the firm as a partner from KPMG in 1989. As part of his role in the Family Business sector he is an experienced corporate finance advisor and, in particular, specialises in family business strategy, corporate governance, succession planning and exits. David acts as a business advisor to a portfolio of successful family businesses. He has a significant network of contacts in banking and capital markets. He is also an active member of the CBI Enterprise Committee, reporting on issues affecting SMEs and family businesses. David is a member of the Family Assembly and Chairman of the Family Business Committee of Shepherd Group and advises on family business, particularly in the areas of succession and corporate governance. Phillips Brothers is a family run business with generations of experience in the supply of wood shavings/sawdust & chopped straw for bedding products for the poultry & Equestrian Markets. Since 1894, they have been regarded as the first choice for wood shavings and straw across the South of England, primarily in Suffolk, Essex, Norfolk & Lincolnshire. As a director in the family firm and passionate about the family business, Jane is joining our panel to provide an insight into the influence of women in the family business, particularly in the context of succession and the need to engage in 'difficult and emotional' discussions. Juliette Johnson Consulting is dedicated to supporting and advising families in business and wealthy families across the generations. Juliette established her boutique consultancy firm in 2013 after over 15 years of experience as an adviser, facilitator and educator to family businesses and wealthy families.With previous roles as Head of UK Family Business at Coutts & Co and Director of the BDO Centre for Family Business, she has developed a strong reputation for helping families transition their family businesses and their family wealth, smoothly and harmoniously from one generation to the next. Over the years Juliette has worked with clients of all shapes and sizes from all over the world, including many of the UK’s largest family businesses and family offices, plus others from across Asia, the Middle East and Europe. Some were transitioning from founding to the second generation, while others were already cousin syndicates, having reached the third generation or beyond. Juliette is joining our panel discussion as we look into the influence of women in the family business. Sian is the Head of family business at PwC in the UK and works closely with entrepreneurial family firms across the UK, especially in the South East. She has a real passion for the family business sector and is joining us to discuss the findings from their latest resarch and to host a panel discussion into the influences of women in the family business.